Four Auburn University alumni have been awarded Fulbright Scholarships, a celebrated educational exchange program sponsored by the U.S. government. Recent Auburn University graduates Catherine Tabor, Andrew Bates, Brianna Gorman and Benjamin Cole will continue their studies in Austria, Sweden and Germany. This is the second consecutive year that four Auburn students have received Fulbright Scholarships. "These Auburn students, now Fulbright Scholars, are community-minded yet have a global perspective," said Melissa Baumann, Auburn assistant provost and director of the Honors College. "They are international representatives for Auburn University and we wish Catherine, Ben, Andrew and Brianna great success during their fellowship studies." Tabor, from Centreville, is a 2016 Honors College graduate earning a double bachelor's degree in German and English literature with a double minor in psychology and community and civic engagement. She will spend her time as an English teaching assistant at a local middle school while pursuing graduate course work in sociology at the University of Vienna. As part of her unique Fulbright experience, Tabor will also work with Caritas Catholic Charity assisting children and youth who suffer from seen and unseen disabilities. While in Auburn, Tabor participated in a variety of organizations, from volunteering with Lee County Autism Resource and Advocacy to coxswaining for Auburn Rowing. "People with disabilities are not often given enough credit for what they can achieve. However, I know they are capable of more; all they need is love, encouragement, opportunity and perspective, which I will strive to bring to my Fulbright experience," Tabor said. Bates, a native of Alpharetta, Georgia, is a 2016 Honors College graduate earning a bachelor's degree in mechanical engineering. While on campus, Bates was involved in a host of service activities including lead engineer on a sustainability study abroad trip to Fiji last summer. He will continue his undergraduate research in sustainable clean water technologies at the Royal Institute of Technology in Stockholm, Sweden. "My study abroad experience provided me a respect for different cultures and a new perspective on culture that instilled in me a deep desire to travel, not to see the sights, but to have stimulating and challenging experiences. I am looking forward to learning Swedish history, the language and sharing in an international research experience," Bates said. A native of Birmingham, Gorman graduated from the College of Liberal Arts with a bachelor's degree in German and a minor in communication in 2016. She was awarded a Fulbright English Teaching Assistantship to teach middle school students in the German state of North Rhine Westphalia. While at Auburn, Gorman served as a German tutor in the athletics department and as a volunteer with Auburn University Wishmakers, which raises funds for the Make a Wish Foundation. "I am looking forward to my Fulbright year teaching English in Germany. Learning a foreign language changed my life, opened my mind and broadened my horizons, and I am happy that I get to help German students have the same positive experience that I did from learning a foreign language," Gorman said. Cole, from Mobile, earned his master's degree in public administration this spring and a bachelor's degree in political science with a minor in German in 2014. His graduate and undergraduate research focused on international security studies with a particular emphasis on the Middle East. Cole will conduct research on the German response to the rise of Islamic extremism, represented by groups such as ISIS, at the University of Cologne. While at Auburn, Cole served as an intern with the Opelika Police Department and as a student research analyst with the Auburn Cyber Initiative. "I am eager to expand my knowledge on security policy joining a team of international relations faculty at the University of Cologne who are taking new analytical approaches to understanding the motivations for terrorism. The Fulbright Scholarship will provide me an opportunity to break out of my comfort zone and work in a foreign environment and learn from people who have a completely different perspective than what I'm accustomed," Cole said. The Fulbright Program is the flagship international educational exchange program sponsored by the U.S. government designed to increase mutual understanding between the people of the United States and the people of other countries. Recipients are selected on the basis of academic or professional achievement, as well as demonstrated leadership potential. "Our scholars are inquisitive and engaging with a range of interests and activities that go well beyond the classroom," said Paul Harris, associate director of National Prestigious Scholarships with the Auburn Honors College. "They will gain so much from their time abroad and they will represent themselves, Auburn University and the United States with distinction." 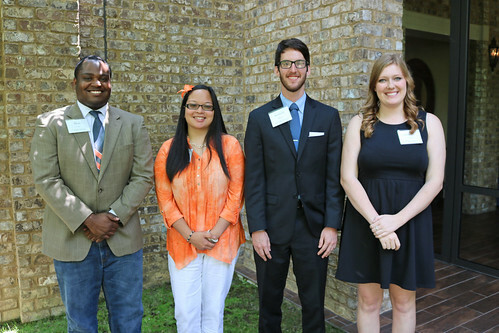 Auburn University graduates (left to right) Benjamin Cole, Catherine Tabor, Andrew Bates and Brianna Gorman will travel across the Atlantic to continue their studies thanks to the celebrated Fulbright Scholarships to Austria, Sweden and Germany.